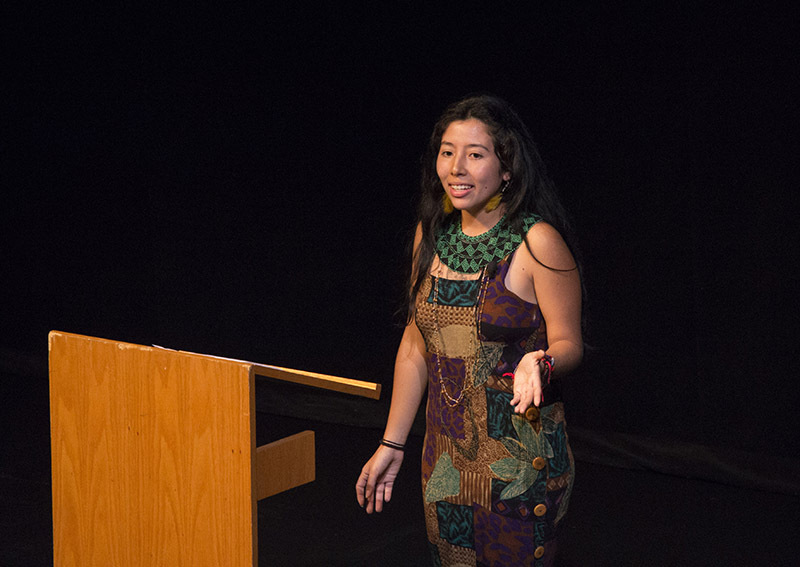 Noemi Salvador, junior, won the C.Henry Smith Peace Oratorical Contest after telling her experience to the audience. Noemi Salvador, a junior, opened her speech with a song from her home, the Kichwas nation in Ecuador, that is chanted to bring rain into the community. That speech won the 2016 C. Henry Smith Peace Oratorical Contest on Tuesday night. Salvador was awarded $500 and the opportunity to represent Goshen College in the national competition that will be held sometime this spring. The night featured five students who presented speeches on a variety of topics that they had been working on since December. Peter Meyer Reimer, a senior, began the night with his speech titled “What Evil Is, and Why It’s Us, You Included.” He admitted that he was racist, classist and sexist, among other things in his attempt to reveal the normalcy with which these things have been treated. While accepting his shortcomings, he urged the audience and himself to begin working to be good people. “It was nice to have a captive audience,” he said. Following Meyer Reimer was Christina Hofer, a senior, with her speech, “Discrediting the Sing Story of Islam,” which took second place and $250. Hofer used her experience with a Muslim host family during her SST in Senegal and a class trip to the South Bend mosque as the basis for her research on Islam. The family she experienced in Senegal practiced a type of Islam that was rooted in peace. She then described the diversity of the Muslim population in the U.S.
“If we ignore this diversity and blindly define extremist Muslims as the only true Muslims, we ignore the voices of those who practice Islam but don’t align themselves with extremist values,” she said. Hofer called for the audience to realize that there is more than a single story of Islam. She brought the crisis of water contamination in indigenous communities to her audience’s attention. Salvador pointed out that oil and mining extraction companies are the source of this problem, justifying their actions in terms of economics. “But tell me how can our lives be priced?” Salvador asked. Salvador called for her audience to protect these indigenous communities and their water by not conforming to the system we live in and by putting pressure on these big companies and the government to move into an era free from fossil fuels. While it’s hard for Salvador to be away from her family and her home, she sees hope in a number of things: life itself, the strength of the people and the very fact that the system can be deconstructed. Yordy addressed the privilege that comes along with being thin and what it looks like to lose that privilege. So Yordy decided to stop being embarrassed about her weight and informed her audience not to be ashamed of the word fat. For Yordy, it was nice to be vulnerable in a space where she was also respected. She opened by telling her cousin’s journey into the U.S. across the Mexican border. As a young boy, he was caught trying to enter the U.S. without proper documentation. After staying in a detention center where minors from Central America were treated like criminals, Carrillo Flores’s cousin was taken back to the border. Despite the officers knowing it wasn’t safe, they left him there anyway. Her speech shed light on the affect that immigration has on children. In the immigration detention centers, children are handcuffed and separated from their families, which is traumatic for many of them. “The reality is that the other side of the fence for most ends up worse than back home,” she said. She challenged her audience not to see immigration as a matter of politics. Carrillo Flores was able to use her privilege in order to represent the voice of the immigrants. The event was organized by Duane Stoltzfus, professor of communications, and had a turnout of 157 people.